"Excellent presentation. Brought up issues that I was not aware could be a potential problem." "Great class- I wish I took the class before the divorce. I think this class is not only for divorcing families but for all family members so that parents have a better view on parenting." "It gave me some different viewpoints and helped me realize some of the "mistakes" I’ve (we've) been making. I actually broke 5 months of no speaking, and dropped restraining orders while i was going through the course." " I liked the videos from professionals ranging from judges to attorneys. It was helpful to hear their perspective." " Even though my ex-husband and I have the most ideal divorce (if there is such a thing),and I thought that we were doing everything right for the most part, I learned a lot from this class. Going into with the mindset that it couldn't teach me anything new, found out very quickly that I was wrong. 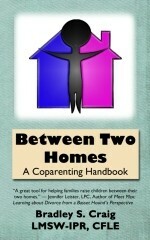 It showed me several areas where both of us co-parents could use improvement. I will be using these tools I learned here for the rest of my life." Why should you take our online parenting classes? Our online classes for families and professionals are designed to provide tools for families in raising children between two homes. The timed courses are read aloud and utilize videos, short quizzes, and interactions to bring the course to life. Information is up to date and is designed to be entertaining and educational. Each course is designed by master's level licensed mental health professionals. The classes are available internationally 24 hours a day 7 days a week, and you can take it at your convenience in your own home. Your progress is stored each time you exit the class, so you can begin where you left off when you come back. You can log on as many times as you need for 30 days or until you complete the class, whichever comes first. Optional material is available for you to print to use with the class and keep for your own at no additional cost. A Certificate of Completion specific to you will be processed and ready for you to print immediately after you pass your final quiz for classes that offer certificates. You will not need to fax or mail test sheets or other materials to us to receive a certificate. You may also have a certificate of completion with an emobosed seal mailed to you. For more information, please see our FAQ page. Click here for our links page and for recommended books and media. Copyright 2012 © Between Two Homes® LLC. All Rights Reserved.